Every time I make chicken soup I have the same dilemma: What do I do with all the leftover vegetables and chicken once the liquid has finished? As I mentioned before, I don’t use soup powders. So to actually have taste, a soup must be made with plenty of bony chicken (wings, neck, stuff like that) , celery, onion, leek, carrots. It needs to boil for a while. The liquid is great and many people like the vegetables as well, but I always end up with vegetables and chicken and no soup. What to do? I tried once to make a casserole out of it. It was OK, but it basically tasted like congealed chicken soup (which shouldn’t have surprised me) and wasn’t very appetizing. In addition, it was of course a meat dish so couldn’t be served with anything dairy, which was a bit annoying. Last week I came up with a solution: I freeze it for later use,, and then some weekday when I need a quick lunch I remove it from the freezer, add some tomato paste and a bit of water and pour it over couscous. I love couscous and chicken soup, instant couscous takes 10 minutes and boiling water to make, and the result is delicious, healthy and filling – and so easy! Finally a solution to the problem! My husband and I saw a poster for a concert we might have liked to go, but we both admitted rather shamefacedly that we were a bit tired of concerts. After all, I said, I had been to Metallica, Chick Corea, Avram Fried, Yaakov Shweiky, Rona Keinan, and Yehudit Ravitz in the past few months (my husbands list is similar, he went to Mashina instead of Metallica). Let’s take a break a bit? And then I looked at the list and thought, my G-d. All that’s missing here is some Mizrahi music and and some far eastern music (my parents still have a cassette – or a record – with weird Korean music on it. I never got the taste for it though I love Korean cooking!) and I’ll be really cosmopolitan! Love Food - Don't waste! Two of my husband’s favorite foods is cheesecake and blintzes. Both of them were traditionally made by my MIL for Shavuot. Somehow it was never made at other times. When we got married he asked me about the cheesecake, and as it’s the easiest cheesecake known to man I made it many times. We bought blintzes every now and then and that was it. A few weeks ago, I offered to make blintzes. After all, I said, I have some blintzes recipes. How bad can it be? He leaped at the suggestion. So it has become a Shabbat staple. We usually eat a very light meal Friday evenings, as it’s late and the kids are tired. Yogurt, cheese, vegetables, hard eggs. Lunch is usually more substantial. 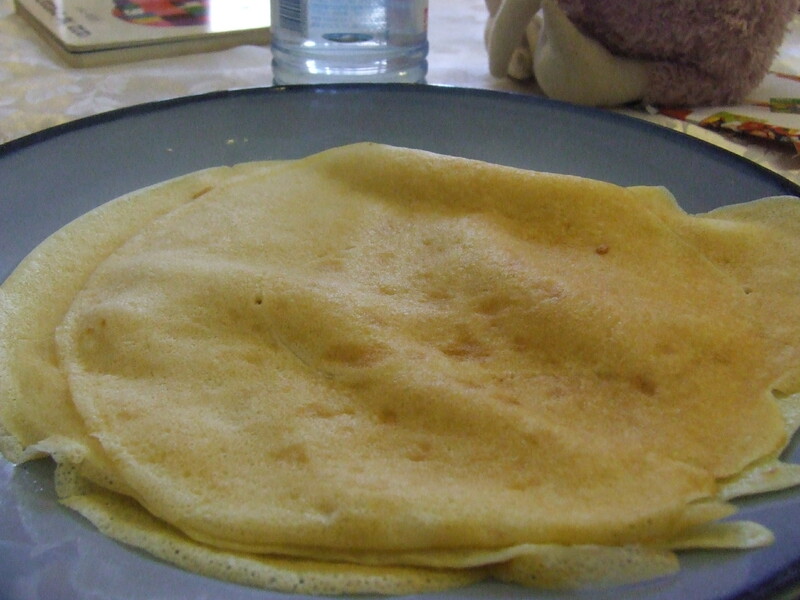 And the Third Seuda used to be pasta, but now it is blintzes, served with homemade jam and sweet cheese. 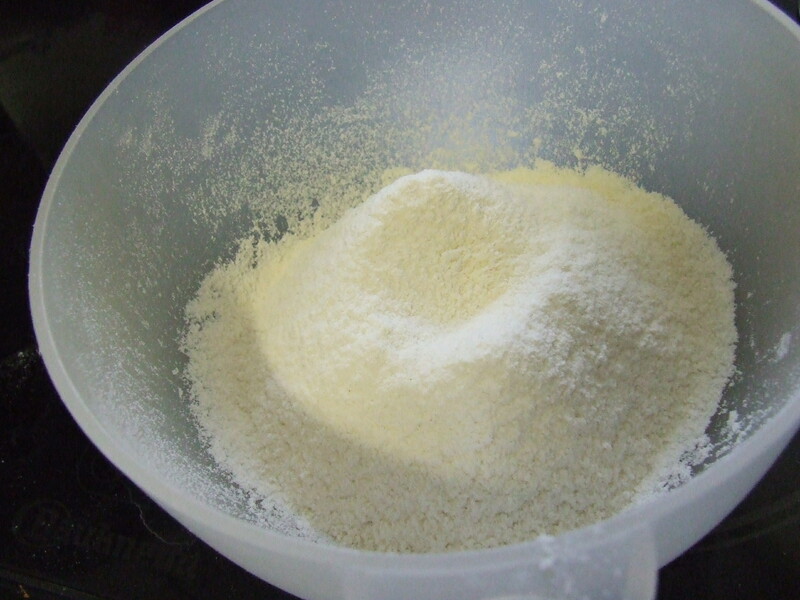 Sift the flour into a medium (at least 1 liter) bowl. Add one egg and about a third of the milk. 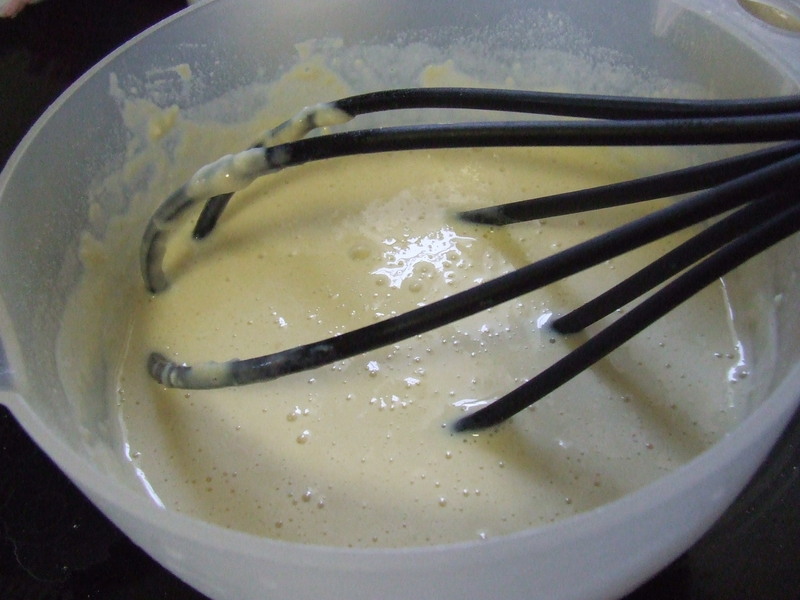 Beat together with a fork or a whisk. It will be very thick. Add one more egg and another third of the milk. Beat together again. It will be pleasantly thin. Add the last egg and the rest of the milk and beat together again. By this time it will be very liquid and you will be wondering if the amounts given here are correct. They are. Mix until there are no lumps (…or at least, until the lumps are very small 🙂 ). Let rest in fridge for at least two hours. Mix well. Oil a frying pan using a spray or (my preferred method) a piece of kitchen paper dipped in oil. Heat on medium heat until hot. Place two large serving spoons full (or whatever fits your frying pan best) in the pan. 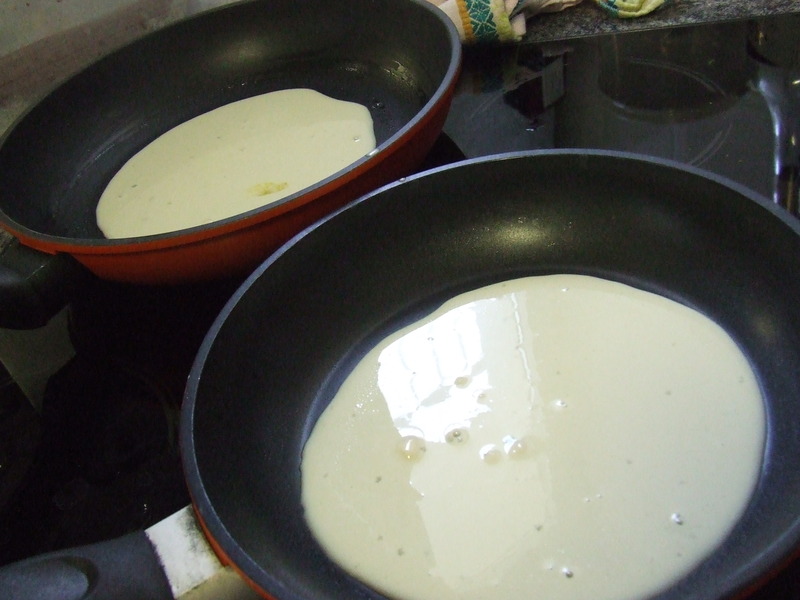 Tilt pan so that batter is evenly spread. 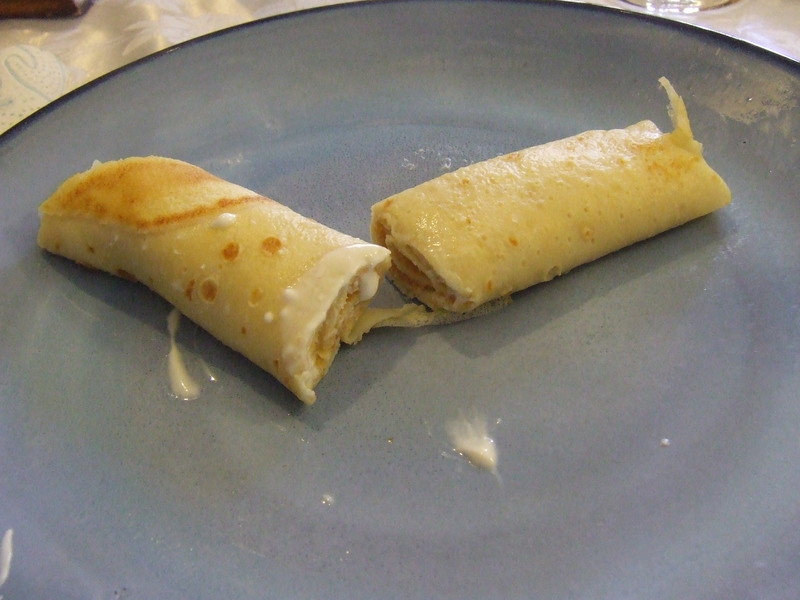 When edges begin to curl up, turn the blintz over (about 2 minutes). Fry another 1-2 minutes and remove from the frying pan. 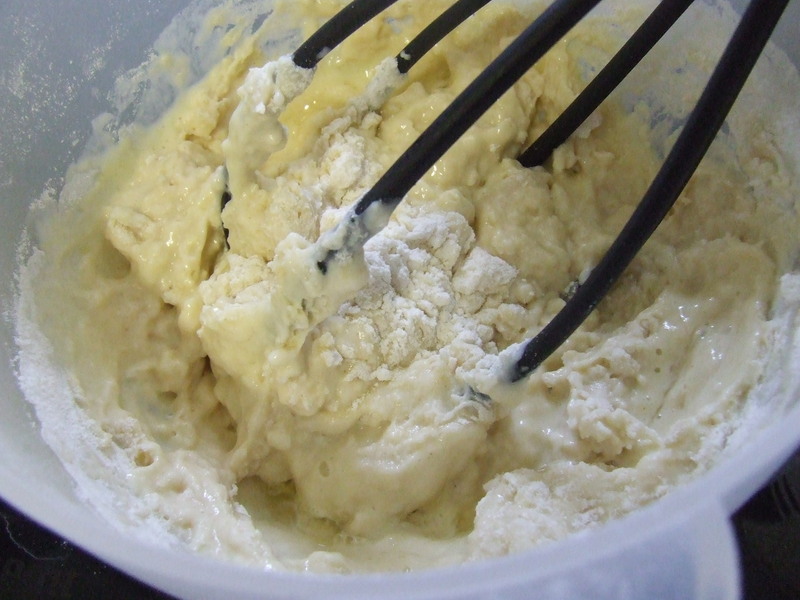 Repeat until all the batter is finished. 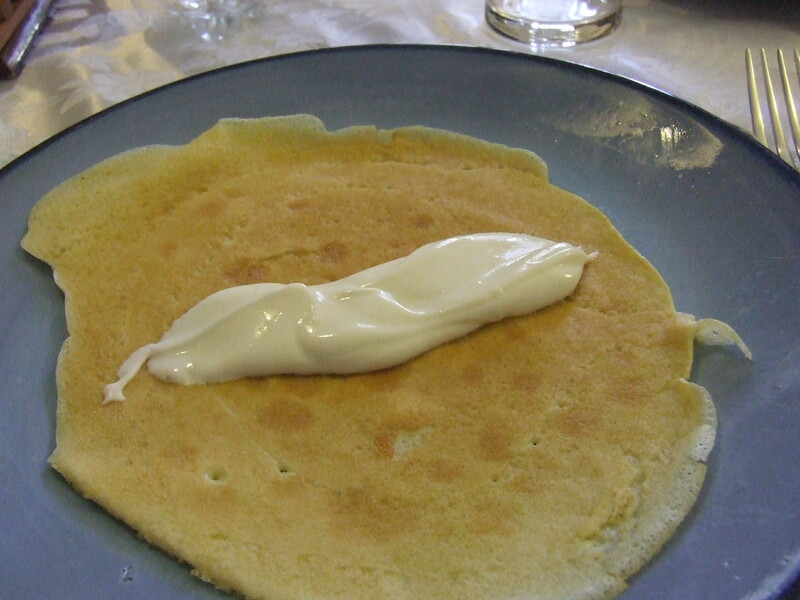 Note: The first blintz always turns out strange – thick, greasy, etc. This is OK.
1-2 tbsp sugar, to taste. Mix all ingredients. Add more sugar if you wish. People tend to treat others the way they were treated. This is heartbreakingly true in the case of abuse – children who were abused tend to turn into abusers – but there a lot of mundane and even trivial examples of this. The most obvious is when driving: If you were cut off, there is more of a chance that you will cut someone else; If everyone else has parked their car in a “it’s only for a few minutes” way when dropping their kid off at the day care you will probably do so as well (“if they would have parked properly, I wouldn’t need to park this way, so it’s not my fault”). If no-one let’s you take that complicated left turn you will be less likely to let someone else turn in your path, etc. The opposite is also true. If someone let’s you in easily you’re more likely to let someone else in, if everyone is parking properly you’re less likely to park in a strange way and block everyone, etc. This is also true in the office (isn’t that great how when people smile at you, you’re more likely to smile at someone else?) with your kids, everything. The Rambam said that we should look at each of our actions as if we have exactly a balance between good and bad actions and this next action will tip the scales. Also that we should look at each of our actions as though it could tip the scales of the entire world. Perhaps this is because of what I said above – your next action will spread among everyone who meets you and affect them for good or bad. One mean-spirited or spiteful action will cause a ripple of spitefulness. One good and kind action will cause a ripple of kindness. So let’s all try to smile more, and be polite more. It affects more than we think.